For once, the timing worked out perfectly – fall is here for good! Just a simple pumpkin hat knit using US 8 needles and Berroco Comfort in Kidz Orange/9731 and Gooseberry Heather/9791 (recycled from this project, which never came to fruition). The fit is perfect – covers his ears, and isn’t too tight. It’s nice to have the model on hand at all times! The only interesting construction note is that I knit this hat in stockinette to the decreases, then dropped stitches and made neat, tight ribbing (per TECHknitter). We’ve had quite a week over here – little Gregory had surgery on Wednesday. We were understandably nervous, but he is recovering well, and seems happy to have mom and dad fawning over him 24/7. Hope you’re doing well, little Gregory! Ah, those cheeks, they are so chubbylicious! Super cute! Did you use a pattern? I might just have some orange yarn on hand! Cute lil’ pumpkin:) Surgery is always worse for the parents! Glad G (and you!) made it through well. Love those smiles! No wonder you fawn over him! He is a real doll and his personality shines out! hang in there as a parent! G is adorable! Love on him despite all around you! Hugz & love! Your boy seems very happy! He’s so cute! It’s a good sign that he is recovering well! De-lurking to say congrats on the babe–I’ve been watching him grow up through your pix and he is a charmer. Cute baby, cute hat. Surgery, oh my! Hope he has a quick recovery. Pumpkin hat is just in time! My goodness that child is beautiful!!! OMG! Gregory is ADORABLE and certainly wears a hat nicely. What a cute ‘li’l pumpkin’. Also, thanks for the tip about the dropped running stitch to create the ribbing. What a great idea! Glad all is well and Gregory is the perfect model for that pumpkin hat and outfit! Could he be any cuter?? Glad to hear he came through surgery well. Hat and baby are both adorable! So glad all went well with little ones surgery. Oh look at that smile in the first picture he is so cute. Glad the surgery went ok.
cute little hat! i’m glad his surgery went well and that he’s recovering nicely. He seems to be very happy! adorable hat!! I love that you also fixed up the ribbing as per the TechKnitter! Brilliant Stuff! wow..what a cutie!! I’d been out of the hsbit of reading my favorite knitting blogs until just recently..what a surprise to come back and find out about Gregory!! love the hat on him..
I’m glad that he (and you) is recovering from surgery well. The hat is super cute! Is he at the stage where he is always trying to pull things like hats (and shoes and socks) off? He is so cute in that hat. Perfect for right now. So happy that he did well with his surgery. My son, also Gregory, :), had surgery when he was 2 months old too. One of the worst feelings in the world has got to be handing your child to the OR nurse. Very glad you’ve got that behind you and he’s doing well! 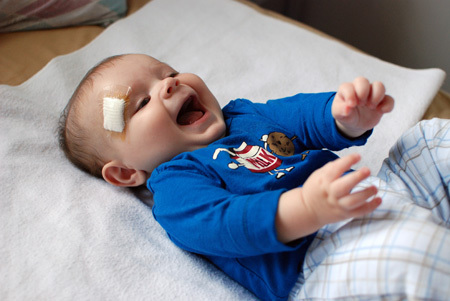 First, it’s Good to see little Gregory looking happy and healthy after surgery. I have made two pumpkin hats with Comfort — it’s a great yarn for that kind of project. Your model is especially cute! May the surgery be a minor one and the recovery quick! 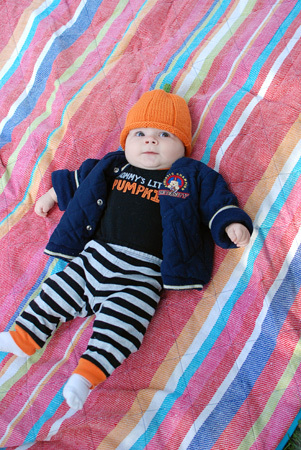 He is more adorable every day and is soooo cute in his Halloween outfit! My baby used to have cheeks like that. I loved every second of pinching them!! Gregory is a beautiful baby. He is perfect for the pumpkin hat. I hope that Gregory is feeling better and that surgery went satisfactorily. that first picture is just the cutest- his expression is hilarious. i’m so glad to hear he is recovering nicely (and you, too)! I second Deia’s question (days later…) Did you use a pattern? If you didn’t, could you be persuaded to write it out and share it? 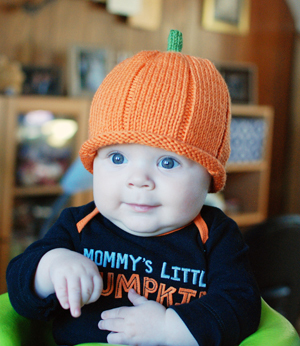 The pumpkin hat is my favorite baby hat pattern! I don’t know why, but it seems so cute. I’m glad that G’s surgery went well.